Blepharo means "eyelid". Spasm means "uncontrolled muscle contraction". Blepharospasm is an abnormal, involuntary blinking or spasm of the eyelids and is usually a life-long condition. It is a fairly rare disease, affecting only one in every 20,000 people with average age: 45-70. It affects women more than men and tends to occur within families. Involuntary facial movements have been recognized for long time and were depicted by artists who were fascinated how these movements distorted the facial expression. First described in the 16th century by the painting by Pieter Brueghel entitled "De Gaper." 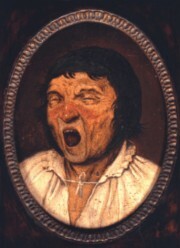 (a woman with apparent blepharospasm and involuntary jaw opening). In 1907, Meige described a similar patient with dystonia which is now termed Meige syndrome (combination of blepharospasm and involuntary jaw and mouth spasms). In 1956, Henderson wrote a classic article on Blepharospasm describing the disability and treatments. The term dystonia means involuntary sustained, patterned, twisting, pulling or squeezing movements. In some patients the dystonia spreads to involve the vocal cords (spasmodic dysphonia), trunk and limbs. • Segmental cranial dystonia: eyelid and facial spasms associated with spasms in the cranial nerve distributions in addition to the seventh nerve. It's unclear precisely what causes blepharospasm. It's believed abnormal functioning of the part of the brain called the basal ganglia. The basal ganglia play a role in all coordinated movements. What is unknown about this is what makes the basal ganglia function incorrectly. • Adverse reaction to prescribed drugs such as those used to treat Parkinson's disease, as well as sensitivity to hormone treatments, including estrogens. Blepharospasm can also be a symptom of acute withdrawal from benzodiazepine dependence. In addition to blepharospasm being a benzodiazepine withdrawal symptom, prolonged use of benzodiazepines can induce blepharospasm and is a known risk factor for the development of blepharospasm. • Neurological conditions such as Parkinson’s disease and multiple sclerosis. • Those that cause ocular irritation (eg, trichiasis, corneal foreign body, keratoconjunctivitis sicca). • Fatigue, stress, or an irritant are possible contributing factors. Before the development of sustained closure of the eyelids, about one third of blepharospasm patients report increased frequency of blinking, commonly associated with a feeling of irritation in the eyes and light sensitivity (photophobia). In the early stages it may only occur with specific precipitating stressors, such as bright lights, fatigue, and emotional tension. As the condition progresses it occurs more frequently during the day and it may intensify so that when the spasms occur the eyelids may remain forcefully closed for short periods of time (the patient is functionally blind). Some sufferers have twitching symptoms that radiate into the nose, face and sometimes the neck area. The spasms disappear in sleep, and some people find that after a good night's sleep, the spasms don't appear for several hours after waking. Concentrating on a specific task may reduce the frequency of the spasms! * Hemi facial spasm, a non-dystonic condition involving various muscles on one side of the face, often including the eyelid, and caused by irritation of the facial nerve. The muscle contractions are more rapid and transient than those of blepharospasm, and the condition is always confined to one side. Electro diagnosis is an important tool in the diagnosis of blepharospasm. 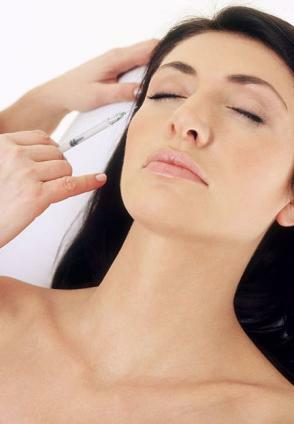 Treatments include botulinum toxin injection, medical drug therapy and surgery. In the early 1980's, Scott described botulinum-A toxin treatment for strabismus and soon after began using it in blepharospasm. Botulinum toxin (BTX) injections into the eyelids and eyebrows (selective ablation of facial nerve, temporal and zygomatic branches) is now considered the treatment of choice, providing moderate to marked improvement in over 90% of patients. The injection of botulinum toxin may be performed using electromyographic (EMG) guidance. An injectable electrode attached to an EMG machine allows the muscle to be identified and the toxin injected precisely into the muscle. Among most sufferers, botolinum is the preferred treatment method. The average latency from the time of the BTX injection to the onset of improvement is 2-5 days and the average duration is 3-4 months, after which time the treatment must be repeated in order to sustain the benefit. Most patients can resume a relatively normal life with regular Botulinum treatments. A minority of sufferers develop minimal or no result from Botox injections and have to find other treatments. For some, Botulinum diminishes in its effectiveness after many years of use. Although about 10-15% of all treatment sessions are followed by some side effects (ptosis, blurring of vision or diplopia, tearing, and local hematoma). The complications only rarely affect patient's functioning and usually resolve spontaneously in less than two weeks. Drug therapy for blepharospasm has proved generally unpredictable and short-termed. Some patients with blepharospasm have partial relief from medications such as clonazepam, trihexyphenidyl, lorazepam, baclofen and tetrabenazine. Anticholinergics have been the most common and effective drugs. In some cases a dietary supplement of magnesium chloride has been found effective. Surgery: Patients that do not respond well to medication or botulinum toxin injection are candidates for surgical therapy. The most effective surgical treatment has been protractor myectomy. Myectomy, is a surgical procedure to remove some of the muscles and nerves of the eyelids, is also a possible treatment option. This surgery has improved symptoms in 75 to 85 percent of people with blepharospasm. Sunglasses help decrease the light sensitivity that may cause or accompany blepharospasm. Digital Rectal Massage, used to cure intractable cases of another spasmodic disorder hiccups (singultus), has also been suggested as a cure for blepharospasm. Blepharospasm can be a side-effect of some drugs and changing medication can stop it. Each of these can be used separately, or in combination with the others to provide the best treatment. Prevention is best when it comes to twitching. All in all you should work to relieve your stress and get as much rest as possible. If eye strain results in twitching, be sure you get plenty of breaks during the day to help rest your eyes and reduce the severity of your symptoms.